Wow, I’ve been waiting for years to read this book. When I saw that Ms. Estep was re-releasing her other Bigtime books, I wondered if she would release Nightingale, which had been planned but never released. Sure enough, here it is! Nightingale was a fun return to the land of Bigtime, New York. Bigtime is Estep’s version of New York City with a large cast of superheroes, ubervillians, and regular folk. Abby Appleby is an event planner in Bigtime. Her events are the biggest, the best and the most lavish. She can meet any insane deadline, and can make real the most outlandish concept. Except when ubervillians crash her parties. Which seemed to happen a lot in previous books. By the time this book comes around, Abby has a bit of a complex, striving for the perfect event each time. After just pulling off an event that simultaneously announced an engagement and launched a new line of cosmetics, Abby is on the way home when she stumbles on a superhero battle that amazingly seemed to miss her event this time. She quickly discerns that the lone superhero is Talon, a gadget master who is fending off the Bandit and his band of thugs. Bandit shoots Talon and sprays him with his blinding gas. Abby, a bit of a gadget master herself, whips out her cellphone and scares the bad guys off by playing her police siren ringtone. After they leave, Talon remains conscious long enough to refuse to be hospitalized, and then he passes out. Abby heaves the superhero home via an improvised sled made of a plastic bag and gumption, and nurses him back to health. It’s the perfect scenario to fall in love. The complications in this romance are mostly internal. Abby, determined to be as anonymous as Talon (he has a helm that shocks whoever tries to take it off), calls herself Wren, which reflects her own internal image of herself. He turns that around by calling her Nightingale, because of her beautiful singing voice and his own internal image of her that he has built up in his mind. Since she knows she is no beauty, this sobriquet does not entirely please her. As they each try to get over their hang-ups, they naturally have to contend with the villains behind the Bandit attack. Which makes a perfect circle to the original makup-launch event from the start of the book. This time, Estep has improved her story by making her villains more difficult to guess. Everyone has alliterative names now, which means anyone can be a superhero or an ubervillain. I even suspected poor Piper Perez for a while, a beleaguered secretary who I think could be the subject of an upcoming book. But in the end, the ubervillain made perfect sense, which is just as it should be. 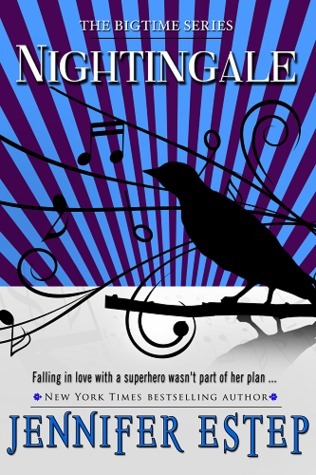 If you enjoyed the previous books in this series, Nightingale should be a great return to the world of Bigtime. If you have not read Karma Girl, Hot Mama or Jynx, it is not necessary to read them before reading this one, but you may want to read them afterward just for the sheer fun of it. And that’s what they are intended to be. Hope you enjoy them! I think Karma Girl is my favorite. I definitely enjoyed the romance in Karma Girl most of all. There is a food scene between her and Striker that is just hilarious.